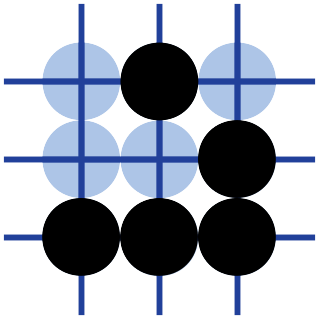 Go Review Partner ("GRP") is a tool to help analyze and review your games of go (weiqi, baduk) using bots. GRP is not yet another SGF editor, it won't allow you to view or modify (adding variations or comments) an existing SGF file. Instead, it takes one existing SGF and "feeds it" to a bot (currently Leela Zero, AQ, Leela, Pachi, PhoenixGo, Ray and GnuGo are supported) then has the bot give its "opinion" on the best moves to play for each game position. GRP proposes a nice interface to review all those data. GRP is free software distributed under the GNU GPL version 3 or later. This means that you can use, study, modify and redistribute - either gratis or for a fee - the program. See the license text for details. Current version is v0.14.2, released on 2018-07-28. Here is a list of zip packages for easy download and setting. If you don't know with one to pick, Leela CPU download is the recommanded choice. Leela 0.11 (CPU only) Download Leela is the most versatil bots to review games. Suitable for handicap games, or games with komi of 0, 6.5 and 7.5 If you do not know what bot to pick, go for this one, especially for laptops. Leela 0.11 (GPU with OpenCL) Download Leela is the most versatil bots to review games. Suitable for handicap games, or games with komi of 0, 6.5 and 7.5 The GPU version of Leela is recommanded for computer with GPU. Leela Zero 0.16 - 64bit Download Leela Zero is super-human level, and can run all all sort of hardward. Leela Zero is best used to review games with komi at 7.5 and no handicap. The weights file included in this package are best nets #208, #173 and #157, but you can add other ones if you wish. This package includes the GPU version of Leela-Zero. Leela Zero 0.16 - 64 bit - CPU only Download The weights file included in this package are best nets #208, #173 and #157, but you can add other ones if you wish. This package includes the CPU version of Leela-Zero. Leela Zero 0.16 + ELF weights - 64bit/GPU Download The weights file included in this package is the weights file converted from ELF bot. AQ 2.1.1 (GPU with Cuda) Download AQ is pro level on common gamer hardware with a decent Nvidia GPU, like GTX 970 or better. AQ is better used to review games with komi at 6.5 and no handicap. Ray rlo-0.2.1 Download This is the version of Ray that is compatible with Leela Zero weights file format (does not require CNTK or CUDA anymore). Any Leela Zero weights files can be used. The weights file included in this package is LeelaZero best net #208. Gnu Go 3.8 Download Suitable for slow/old computers (32-bits). No bot Download This is GRP without any bot, in case you already have the bots installed on your computer. You will need to configure the bots you want to use through the setting panel. For GNU/Linux and MacOS, you need to download the Python source code from Github, and run the application using Python. Check the documentation for detailed instructions.